Is this going to work? Yes, I think so. I am testing things out. So far, so good. Can I follow the cartoon? Yes. Do I have a good way to hold the cartoon in place? Yes. And to put the color and value key where I can see it? Yes. Do I have enough yarn in each of the colors, values, and thicknesses that I need? No. I see some gaps, especially in the mid-to-dark value range. I am ordering more yarn today. Is four-shaft tapestry going to be as delightful an experience as I’ve long hoped? Most probably, yes! Word of the day: Yes! Testing, testing. 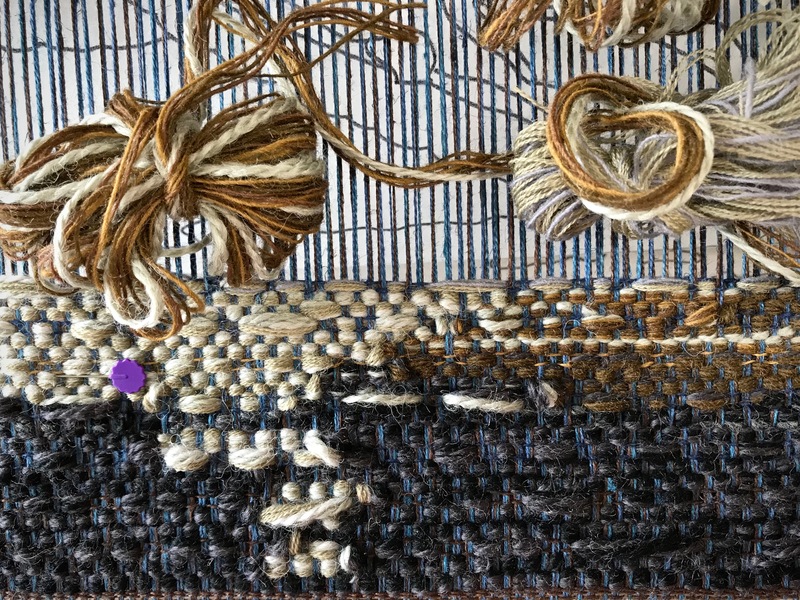 Blending of yarns, blending of colors, checking value contrasts. Blending yarn colors and thicknesses gives interesting results. This is practice for some of the background area of the tapestry. Finding out if I can follow details on the cartoon. Experimenting with adding floats in places as texture to enhance the design. Will I be able to handle multiple yarn butterflies? I think so. 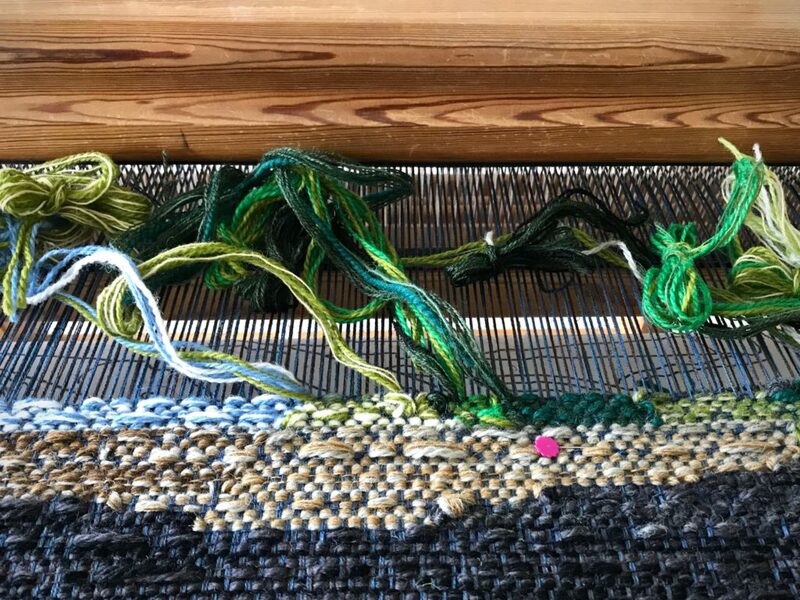 Testing some of the green hues for part of the main subject of the tapestry. Also keeping an eye on selvedges, so they don’t draw in. Plenty of warp is available for practice. I want to test all the critical elements before I start the *actual* tapestry. This tapestry will be woven horizontally. Words. I am affected by words—spoken by others, and spoken from my own mouth. Grace in our words can be an invitation of kindness and relief to someone who is testing our framework. When Christ’s words dwell in us, the richness of his words affect our being. And then, our words of yes and no are grace-filled bearers of hope. May you see hope on your horizon. 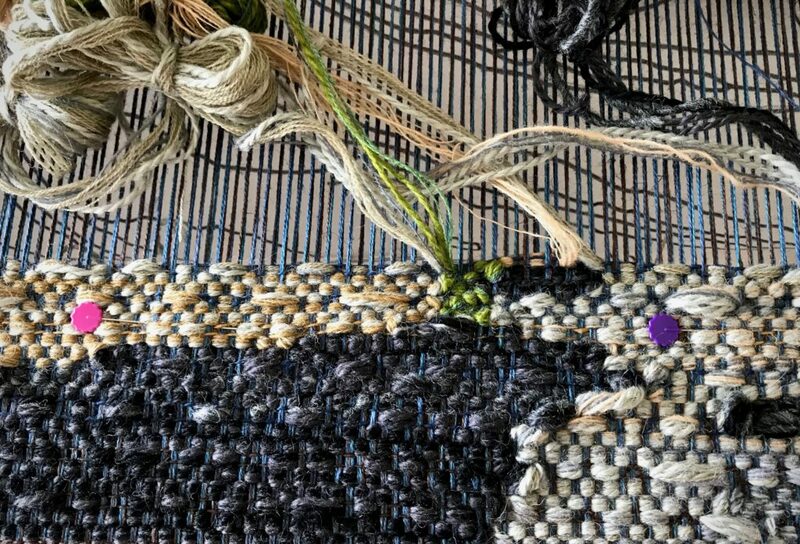 The practice weaving is lovely. Timeless…. Hi Nannette, Ha ha, thank you. 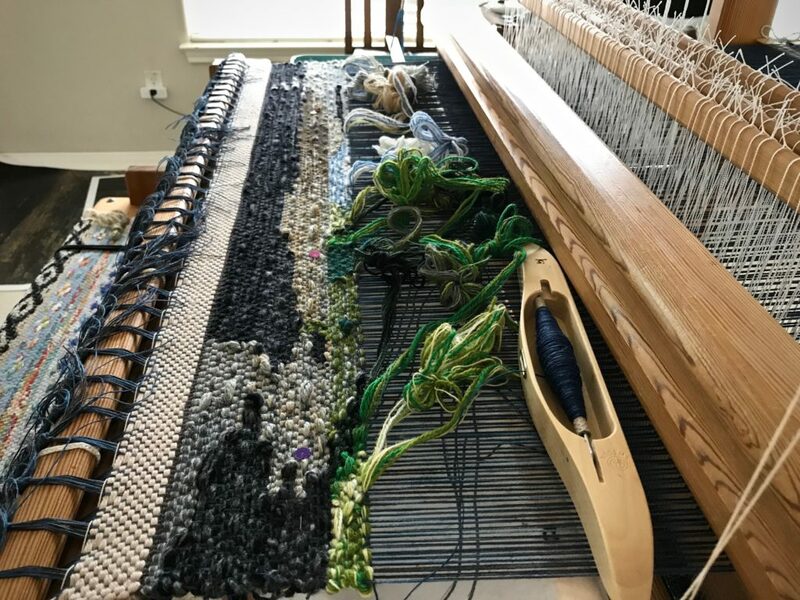 The practice weaving is giving me a taste of the excitement to come! Hi Joanne, I’m looking forward to working on this! I will show my progress as it grows! 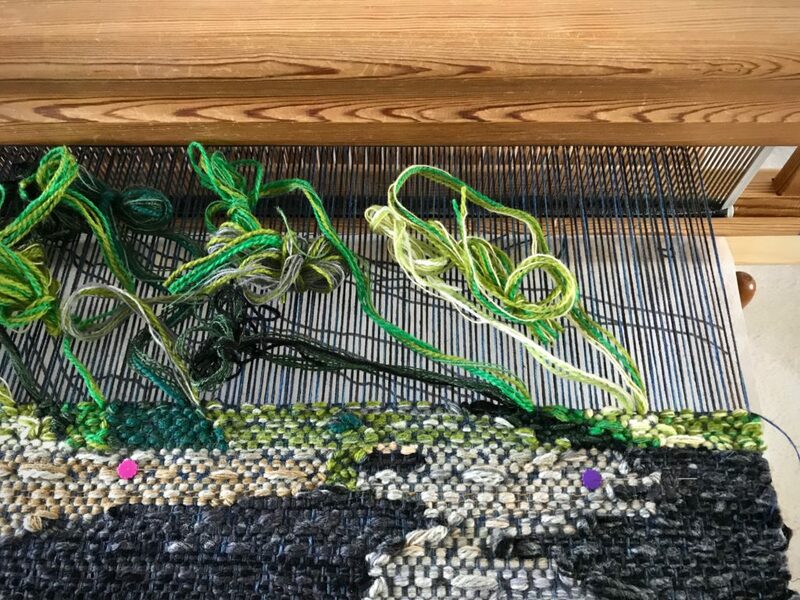 I’m interested in how you attached your cartoon to the loom. 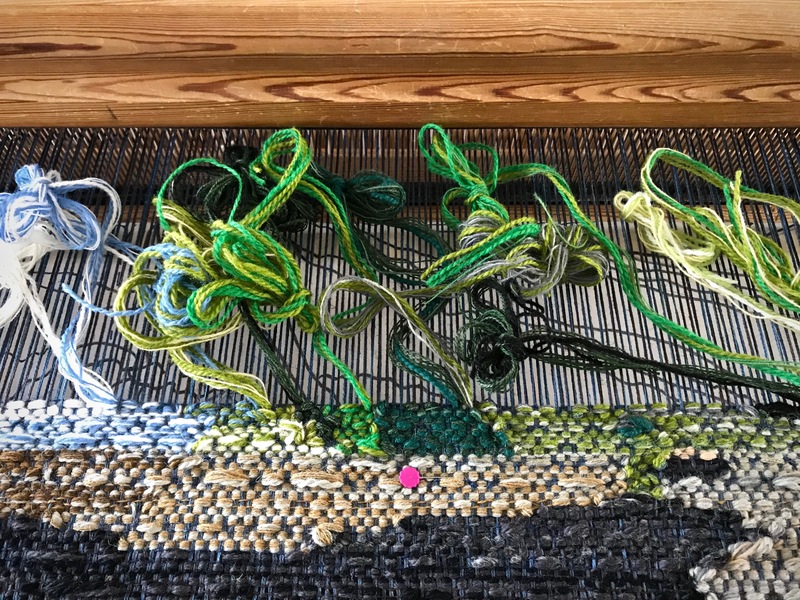 I’ve never done it on a horizontal loom so I’m not sure what I’ll do when the time comes. Love your practice piece. I can’t wait to see what you actually weave. Hi Michele, Thanks for the idea! I think I’ll do a post in the near future on how I attach the cartoon.